Ni Wo Ta 你我他 (Developing Chinese Fluency: An Introductory Course), published by Cengage Learning (2014), is Professor Phyllis Zhang’s new multimedia program. 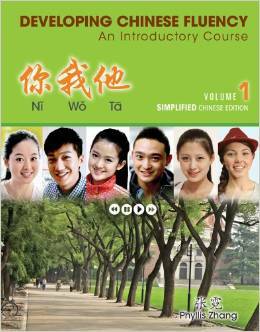 This a new introductory-level textbook series offers beginning learners of Chinese an enriching language learning experience through a narrative video story, innovative instructional design, robust technology integration, and a wide range of cultural coverage. It employs an intuitive and functional approach to proficiency development, with effective strategies to tackle tough areas such as tones, literacy development, and difficult sentence structures. Shot on location in China, the video program offers a fresh and contemporary view of Chinese language and culture. The textbook program’s video-driven pedagogy combines visual and audio stimuli, providing an engaging context for language learning. The program helps students develop their listening skills, tackle pronunciation without becoming overly-reliant on Pinyin, and discover relevant culture information.